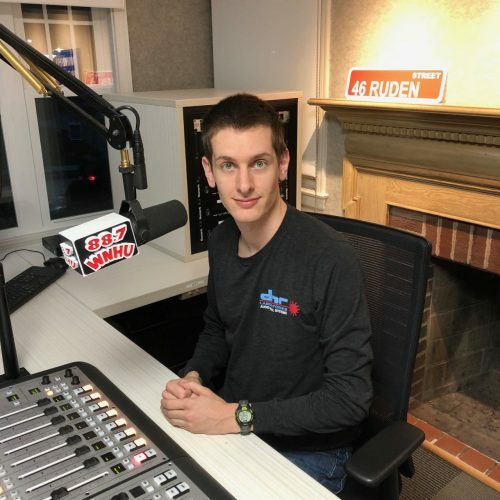 Patrick, aka DJ Downpat27, graduated from the University of New Haven in May 2018 with a BA in Music and Sound Recording. He began his show on Charger Radio, WNHU’s old version of their online and student only station, his freshman and sophomore years. Then he moved up to the FM station for his junior and senior years. During those two years, he was also WNHU’s Assistant Operations Manager. Patrick now works full time for DNR Laboratories, an AV system integration/installation company in Watertown. His show consists of one hour of current pop and EDM music, and one hour of throwbacks ranging from as new as 5-ish years ago to as old as the 70s, and all the decades in between. He also tells a fun fact at the end of the first hour and a quote at the end of the show. When there is a holiday coming up, he puts his normal musical format aside, and does a show with music that relates to that holiday, including saying a fact and quote for that holiday.